Heeft u een vraag voor Coco's Guesthouse? Ontworpen voor zowel zakelijke reizigers als toeristen, is het Coco's Guesthouse ideaal gelegen in Ao Lo Dalam; één van de meest populaire buurten van de stad. Vanaf hier kunnen gasten genieten van eenvoudige toegang tot alles wat de levendige stad te bieden heeft. Dankzij de praktische locatie liggen alle belangrijke trekpleisters in de buurt van het hotel. Voor Coco's Guesthouse is niets teveel om het gasten naar de zin te maken. Zo biedt dit hotel goede service en vele faciliteiten. Het hotel biedt gratis wi-fi in alle kamers, ticket service, bagageopslag, wi-fi in openbare ruimtes, vervoer van/naar luchthaven om gasten een maximaal comfort te garanderen. Gasten kunnen kiezen uit 29 kamers, stuk voor stuk plezierig en comfortabel ingericht. Het hotel biedt geweldige recreatiemogelijkheden die uw verblijf onvergetelijk zullen maken, zoals tuin. 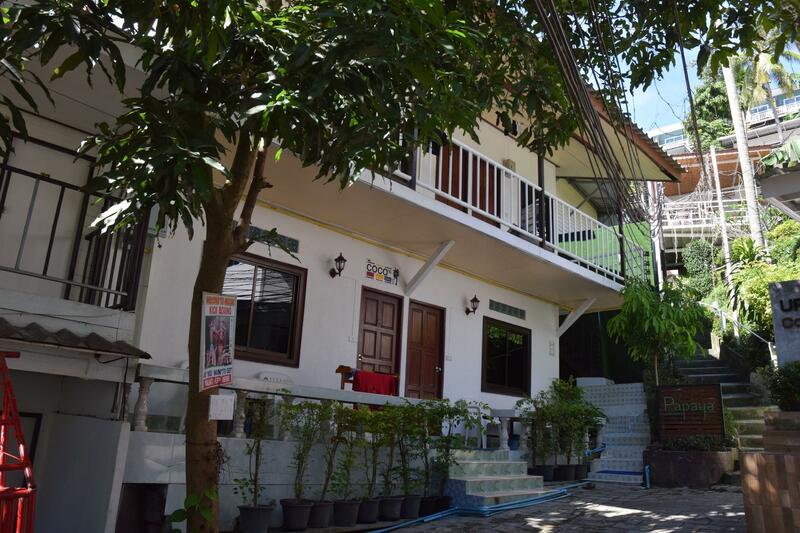 Als u zoekt naar comfort en gemak in Koh Phi Phi, dan is het Coco's Guesthouse uw thuis ver weg van huis. Deze accommodatie vereist een borgsom van 500 THB, te voldoen tijdens het inchecken. Het enige voordeel is de locatie, daar blijft het ook bij. Kamer was enorm smerig, overal zat schimmel. Ook kon je de deur niet helemaal afsluiten waardoor er mega veel muggen waren in de kamer... is het geld echt niet waard! One of the best value private rooms that I found on the island, although not recommended for solo travellers unless you have friends on the island as there is no social area. The guesthouse is located a short walk from the main clubs and restaurants. I would definitely stay here again if I come back to PP! We stayed at the family room ( 4 single beds) and it was really nice. good value for money. Close to view point and not far from the beach. The lady a reception was very friendly and helpful, even had a cold refreshment towel for us which was well needed after the boat trip! It's about 15 minute walk from the pier but it's all flat, good location to get to the main bars and both beaches. The shower in the ensuite was a bit cramped and only cold water but ok otherwise. bedroom was a good size and comfortable. it does get VERY warm though so book an A/C room if that's a problem for you. Rooms are secure and Lockers are available for valuables using your own lock. the managers try to scam 500 for a key deposit that they don't refund. very noisy. internet not working. staff just bad in all points. to avoid. go to other guest house in the same street. much better. We stayed here as it was one of the cheaper places on the island. Basic but fine. Staff were nice, helped us book our onward travel. Our sheet was stained when we arrived but they brought us a new one. No complaints, you get what you pay for. Coco's is located a short walk away from the main bars so you can easily get some sleep at night. However, don't expect much else. It was pricy for Thailand, didn't have any common areas, the WiFi doesn't work at all, no kitchen, no laundry, etc. Simply just a place to sleep. Stayed here for 5 nights and wouldn't stay again. Expensive for Thailand, average for the island, clean basic room it was colder at the time so fan was fine. Reception staff extremely friendly and helpful. Free coffee. Stayed in a couple of places on the island and I would definitely recommend this area for its proximity to the centre, but more importantly the noise levels from the horrendous techno clubs could not be heard here, which beyond anything when choosing your accommodation on Phi Phi I would suggest you make that your priority! Reasonably priced accommodations for Phi Phi island. Close to the main viewpoints and a good spot to be close to the nightlife. Kind of far from any "good" restaurants (of the ones we tried), but you have to walk everywhere anyways so it's not really that big of a deal. Overall, good value for the money. We liked that it was far enough away from the down core that it's quiet, but close enough that it's a quick walk to everything. 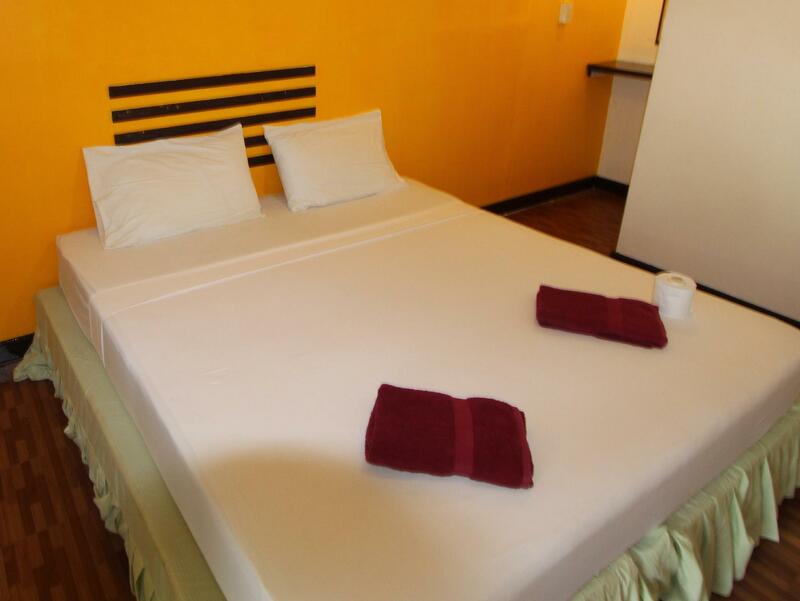 The staff are very helpful and the rooms are comfy and spacious. Our stay was excellent, if we ever needed something the staff were keen to help. Need a good pace to keep up with the "taxi" guy but you will really like this place. It's so close to town, to the beaches, and the viewpoint. We stayed two nights in the standard fan room. It was very basic but was clean enough and the bathroom did not smell. Upgraded to a superior air con room for our third night because we got sick. 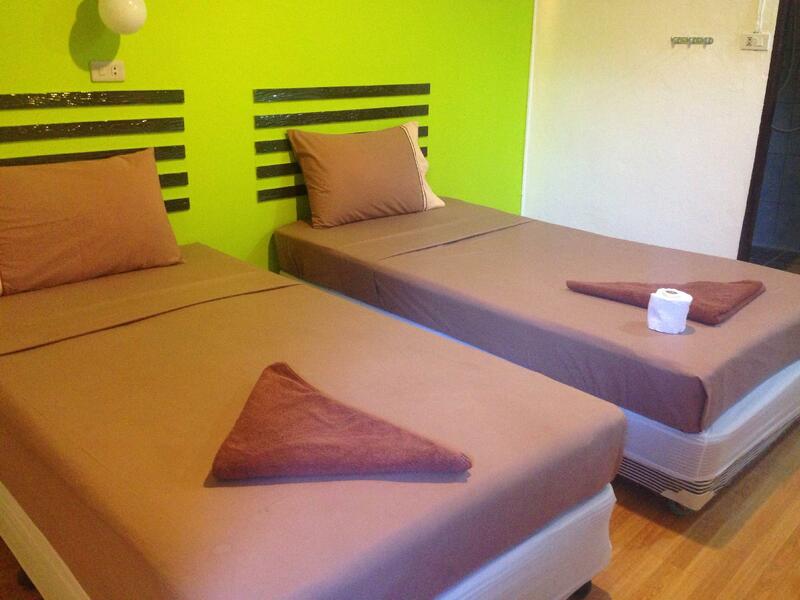 If it's in you're budget the superior room was very nice for Phi Phi, newer and cleaner than the standard room. Location is nice, out of the main party area and mostly quiet at night (except partiers walking home singing and yelling). We had a really nice stay and would definitely stay again. The bellboy/maintenance guy was super friendly and very helpful! I would recommend calling ahead to let them know which boat you will be arriving on and someone can get your bags and lead you to the hotel as Phi Phi is confusing at first! We stayed for 3 nights and there was no television so if it rains, there is nothing to do in the room. 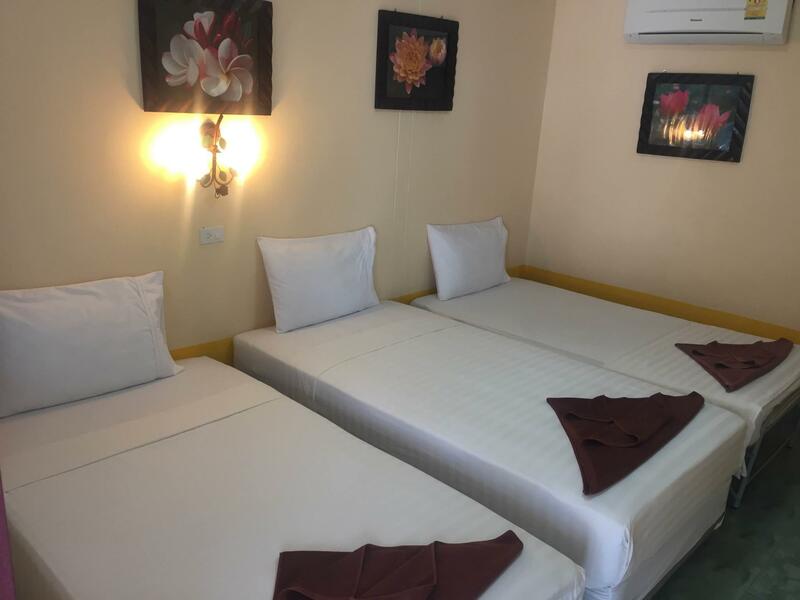 The price given per night is somehow to be considered a little bit expensive as other areas are able to provide better service with television and also able to provide shampoo. This guesthouse only provides soap and no one actually cleaned the room for the 3 nights I was there, I just asked to changed towels on the 2nd day i was there. The blankets were very thin which doesn't really look like blankets, it looks like very thin towel so if the air conditioner gets a little cooler, the thin blankets wont help much. However, on the good side, this hotel is not near to the drinking areas so you able to get a good night's sleep. This guesthouse is built a little higher with very narrow stairs so if you have huge luggage, will be a little difficult to get to the 2nd level of the guesthouse. Staff was friendly, room was clean and comfortable, quiet at night, close to the Viewpoint walk. It is a reasonable price for Koh Phi Phi, where everything is overpriced and all ratings are so bad. By the way, Koh Phi Phi is the most beautiful island in Thailand, but they have turned into a landfill - very sad! When I arrived I was unsure how to get to cocos but they sent a member of staff to meet me & carry my luggage for me to the hotel. The hotel itself is about 10-15 minutes from the pier and about 10 minutes from the main streets so is perfect to be close to the action without being kept up by the noise. I could not have the room and I was told I must cancel the reservation only with Agoda. I tried to call 4 times the Agoda customer service and was impossible to talk to anyone. I got charged for a room I did not have, somebody else must have took my room and I lost 100 Euro for nothing. Extremely bad experience!!! Was cheap so shouldn't complain too much but you can get much better for less. Toilet leaked, water from shower and toilet didn't drain away. Window and door didn't close properly. Aircon was very noisy. If your a visiting in the low season and after budget accommodation, I would recommend not booking anything until you get to Phi Phi. Always best to see the room before paying. They are more likely to show you one of their better rooms. The lady at the front desk had good English so communication was great which made check in easy but this place is surrounded by stagnant water, you couldn't sit outside your room because the Mosquitos were unbearable. The water that ran from the tap was yellowish brown colour, I washed my swim suite in the sink and left it out to dry, the next morning it smelled of sewage. We booked a 2 double bed room to find 4 single beds crammed into the room. There is no fridge and it's very over priced, there were 4 of us and they charged us 500 baht each. I don't know if it was something we ate, or possibly contaminated water we brushed our teeth with but all 4 of us became quite ill after our stay. I would never stay there again or recommend this place to others.